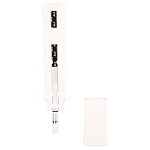 Urine Alcohol Tests with Plastic Cassettes is a one-time use test that detects the presence of alcohol in a urine sample.The test strip will change from a neutral color to a distinct color if alcohol is present over the cut-off level. It is inexpensive and easy to use. The device not only confirms the presence of alcohol, but also approximates the actual BAC using a built-in scale.